A teenage girl in medieval France challenges an evil landowner to a steeplechase race in order to save her father from being imprisoned in the castle’s dungeon. 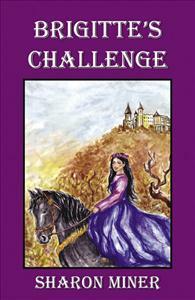 Brigitte, a teenage peasant girl in medieval France, challenges an evil landowner to a steeplechase, a new type of horse race, in order to save her father from debtor’s prison. A renowned knight, Sir Romér, offers the use of his champion jousting stallion, Sébastien, to aid her in her goal and to teach Brigitte how to jump the obstacles in the race. "Brigitte's Challenge is an exciting romantic tale, with a glimpse at the bravery needed just to survive in France during the Middle Ages." “An excellent hair-raising thriller. An exciting story that will appeal to children."